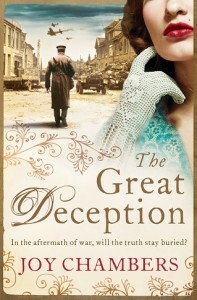 Bermuda resident Joy Chambers has published her most recent novel – The Great Deception. The Australian born writer and actress is known for appearing in television soap operas, playing Rita Merrick in The Restless Years, Dr Robyn Porter in The Young Doctors, and Rosemary Daniels in Neighbours. She is married to television producer Reg Grundy and they presently reside in Tucker’s Town. The book’s synopsis says: “A superbly-researched mystery thriller set mainly in England and German-occupied Holland during World War Two: The Great Deception is exactly that. A fascinating tale about the GREATest deception immaginable. “The book begins on the Southern Tablelands of New South Wales, Australia in 1947, two years after the end of the Second World War, when one morning Shelly Wareing, wife of Cole Wareing, now a country farmer, receives a visit from Cole’s wartime friend and comrade, American, Tudor Harrington. “Cole vanishes the very same night, leaving only a note for Shelly to say that he will come back no matter how long it takes. Shelly is bewildered.